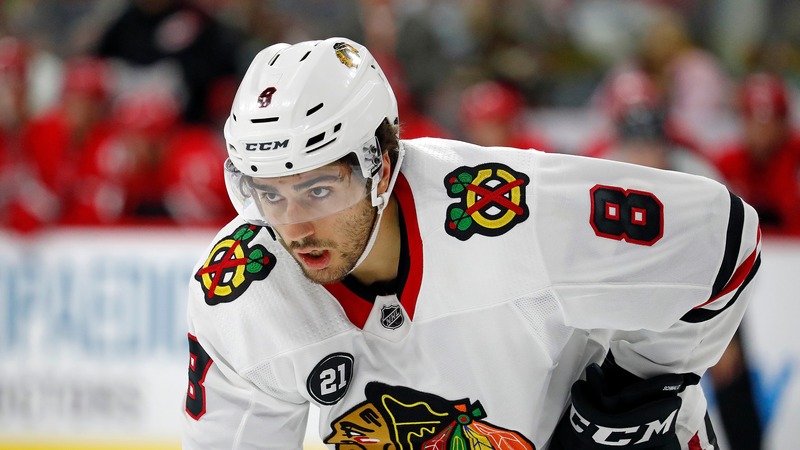 The Chicago Blackhawks continued to shake things up by trading Nick Schmaltz to the Arizona Coyotes for former first-round picks Dylan Strome and Brendan Pelini, but the move is also a signal to the rest of the NHL. Less than a month after [firing three-time Stanley Cup winner Joel Quenneville](https://www.betchicago.com/blackhawks-fire-coach-joel-quenneville) in an effort to shake things up, the Chicago Blackhawks were at it again late Sunday night/early Monday morning. News of the Nick Schmaltz trade to the Arizona Coyotes isn't a huge shock given the way things have been trending, but flash back to two months ago and it's downright stunning. With Schmaltz coming off 52 points in 78 games last season as a 21-year-old, the Blackhawks made it clear this offseason that they wanted Schmaltz to be a big part of their long-term plan (Stan Bowman called locking up young talent their [No. 1 priority](https://theathletic.com/675727/2018/11/26/powers-blackhawks-trade-nick-schmaltz-add-dylan-strome-in-first-post-quenneville-move/) and mentioned Schmaltz specifically). With Schmaltz's restricted free agency approaching next offseason, there were talks that his extension could be worth as much as $6 million per year if he showed the improvement for which the organization hoped. By November, he'd been scratched once by Quenneville to send a message that was never really received. Even with assists in his last three games, Schmaltz has just two goals and nine assists in 23 appearances. And while there were some peripheral numbers to suggest he'd get better later in the season, the Blackhawks weren't willing to wait. In return, the Blackhawks got winger Brendan Perlini and center Dylan Strome from the Coyotes. Perlini was the No. 12 overall pick at the 2014 NHL Draft, and Strome was the No. 3 overall pick at the 2015 NHL Draft. Perlini and Strome are at different stages in their careers. Perlini is a big wing with power and speed who can get into scoring areas and convert, though his vision leaves a lot to be desired and makes him rather one note offensively. Still, he's scored 31 goals in 131 games over his first two seasons and has created more high-danger scoring chances than Schmaltz this season (23 to 14), despite having only two goals and three primary assists (same as Schmaltz). Luckily, his peripherals suggest the goals will come, as he's shooting just 5.0 percent this season after shooting 14.0 percent his first two seasons. Meanwhile, nobody can [come to a conclusion](https://theathletic.com/675730/2018/11/26/nhl-trade-grades-blackhawks-gamble-in-dealing-for-dylan-strome/) on Strome, who is a high IQ player with a huge shot but just doesn't skate well. He's played in 48 games spread out over the last three seasons and has seven goals and nine assists in those contests despite averaging a little over 13 minutes of ice time a night. He has, however, averaged more than a point per game at the AHL level, indicating the type of scoring potential he might have if the circumstances were right. Estimating conservatively, Perlini is a capable middle-six wing with upside, and Strome is a bottom-six forward with the potential to provide power-play and goal-scoring value. Even without much hope that his feet will get better, marginal improvement might change his profile considerably. __Play to win:__ [Enter our NHL Puck Drop contest for Tuesday night's Blackhawks vs. Golden Knights game and win a BetChicago prize pack! ](https://betchicago.chalkline.com/games/chicago-nhl-puck-drop?external_referrer=https%3A%2F%2Fwww.betchicago.com%2Fblackhawks-desperate-secondary-scoring-nick-schmaltz) It's pretty clear that the Blackhawks are trading on upside here, sending Schmaltz (the No. 20 overall pick in 2014) for first-rounders from 2014 and 2015, which is a pretty common form of trade in the NHL. When prospects don't pan out the way an organization hopes, the team looks to swap them for prospects in a similar situation, both sides convinced they can get more out of somebody else's scraps. That being said, this trade was worth a shot for the Blackhawks. They [need secondary scoring](https://www.betchicago.com/blackhawks-desperate-secondary-scoring-nick-schmaltz) (piece written hours before the Schmaltz trade, but point still illustrated), and Perlini and Strome both have 20-plus goal potential, with Perlini close to recognizing that right now and Strome trading on projection. Even with Schmaltz being the most proven player involved in the deal, the Blackhawks getting two quality second- or third-line players to replace one is encouraging to a squad that has lacked forward depth. However, the trade also plays into one of the biggest fears about the makeup of this Blackhawks front office. This is just the latest in a *long* line of top draft picks driven out of town before they could reach their second contracts. Schmaltz joins a list of former first- or second-round picks who didn't reach a second contract in Chicago that includes Dylan Olsen, Stephen Johns, Phillip Danault, Adam Clendening, Brandon Saad, Teuvo Teravainen and Ryan Hartman. However, the difference between Schmaltz and most of the others is that several of those players didn't perform at all or performed so well that the Blackhawks were at risk of being priced out of their services. That's not the case with Schmaltz. The Blackhawks might not have known what to make of his future, but he still has obvious value. So this trade signals that the front office knows the walls are closing in and that they're in a position where they have to take chances. If this were five years ago and the Blackhawks were in the thick of contention, there's no way they trade a 22-year-old who they have limited control over this offseason just because he's had a rough go of it for two months. But they're not in realistic contention. They're 9-10-5 after the weekend's action, they just fired the most beloved coach they ever had and now they're shipping a player off they thought would be part of their new core moving forward. That sends a very clear message to both the players on this team and the rest of the NHL. If things don't begin trending towards at least a playoff appearance in the next month or so, you can expect even more sweeping changes.